Notes: Large sized spring reverb tank, Accutronics 9BB2C1B with 3×2 springs and medium decay (1.75 - 3 seconds). 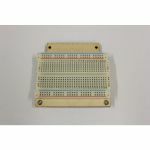 Notes: The BitBoard is a breadboard add-on module that allows users to build custom circuits and user interfaces for the BitRanger. It is solidly attached to the BitRanger and provides performance friendly stability. It either comes just on its own, or with with 2 pots, 2 buttons and 4 switches which can help you to start designing your own bitRanger interface. The BitBoard is closely linked to a project called OMSYNTH which is a breadboard based open modular synthesizer by Casper electronics. Several tutorials on how to make circuits are available on the OMSYNTH webpage. Notes: 100 of Befaco's unique screws designed specifically for Eurorack. These M2.5 screws can be secured by hand, all common screwdrivers and Allen Key. These are great for saving time when rearranging your synth. Each Knurlie comes with a fitted plastic washer to prevent rack rash. 100 of Befaco's unique screws designed specifically for Eurorack. These M2.5 screws can be secured by hand, all common screwdrivers and Allen Key. These are great for saving time when rearranging your synth. Notes: 50 of Befaco's unique screws designed specifically for Eurorack. These M2.5 screws can be secured by hand, all common screwdrivers and Allen Key. These are great for saving time when rearranging your synth. 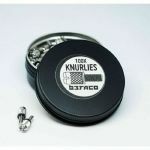 Notes: Knurlies are the first screws specially designed for Eurorack - engineered with love by Befaco to make re-arranging your case a matter of minutes! Knurlies can be fastened by hand, phillips, slot or allen, and include plastic washers to avoid rack-rash. These screws are M3x7mm, so they can also be used on 3mm thick panels as well as regular 2mm ones. Notes: The Editors Keys Studio Series Headphone is simple yet beautiful headphone stand, which can sit perfectly on your desk next to your computer monitor. If you want to prevent your headphones from becoming damaged during recordings, you need the StudioSeries Desktop Headphone Hanger. Notes: Allows for rack mounting of the Analog Four MKII and Anlog Rytm MKII. Notes: The Endorphin.es cover protects the sockets and control elements of your Shuttle Systems on the road. The lid is deep enough to transport the modular instrument with patch cables plugged in. A self-adhesive strip (included) holds the cover in place. Green LED indicates positive voltage. Red LED indicates negative voltage. Notes: GPO C90 blank cassette tape wound to C90 length - 45 minutes per side with Type I / Ferric tape. Supplied in a clear case with J-card and stickers. Notes: This hanger clamps to any desk with 5 to 45 mm thickness to put your headphones in easy reach. It features two convenient slots to keep your headphone cables neat and tidy, and the plastic set screw tip protects your desk's finish. Notes: Designed for both home and professional use, this elegant table-top headphones stand securely holds up to two large sets of headphones. Convenient slots on the holder facilitate convenient and tidy routing and storage of cables or ear buds. The stand features a die-cast aluminium base and tower construction, whereby the holder itself is made of plastic with a rubberised finish. Notes: Visual display of audio signal via LED horizontal bar indicators. The VU meter LED display responds to the audio signal level and creates an easy to see visual confirmation of your signal. Visual display of audio signal via LED horizontal bar indicators. The VU meter LED display responds to the audio signal level and creates an easy to see visual confirmation of your signal. Notes: The idea is to allow you to turn any cable into a mult. Connect any Eurorack compatible patch cable to the HUB and then leave them hanging off your patch or magnetically attached to strategic points. This makes more room for the user interface of your modules and complex patches are easy to trace through. Notes: BopPad Mount connects to a cymbal stand providing a convenient way to incorporate BopPad into your drum kit. Its anodized aluminium frame ensures it is both lightweight and rugged and the M8 thread is compatible with most cymbal stands available today! Notes: Receives DIN Sync data (sometimes called Sync-24) from a single source (e.g. sequencer or drum machine) and produces identical copies at the 5 DIN Sync Output sockets. These can then be connected to the SYNC IN sockets of other devices which require DIN Sync signals sent to them. 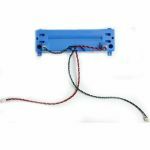 - 9V switch mode power supply included. Products bought directly from Kenton are supplied with the appropriate power supply for the delivery address. Four types are available, UK / EU / USA / Australia. Notes: Its all about the things you connect to the Field Kit FX! To get you started, Koma Elektronik decided to offer an FX Expansion Pack with a bunch of handy cables, contact mic's and spring tank that you can use and connect to create your own signature sounds. Notes: THE FUGGEDABOUDIT TOUR CAP is for those knobs that RARELY need adjustment. The TOUR CAP hides your signature settings as there is no set line and replaces your existing knob and retaining nut. Set your pot to desired setting and screw TOUR CAP on and FUGGEDABOUDIT! If you need to change settings just unscrew easily by hand, readjust potentiometer and screw TOUR CAP back on. IT DOESN'T GET MUCH EASIER THAN THAT! Works great in conjunction with THE LOKNOB so mix them up to fit your needs! Made of machined 6061t6 aluminium. Notes: Remove your knob from guitar then install Nut-Hugga to the bottom of your existing knob and reinstall! No Tools needed! Great for those Pesky Strat knobs you keep hitting! Comes in 3 pack. Notes: SWITCH HITTA protects most common push buttons and toggle switches from moving until desired M12X0.75 threads. Tired of hitting push buttons and switches by accident? Then you need the Switch Hitta! Notes: THE LOKNOB is an upgrade from your existing knobs. Machined out of 6061t6 aluminium., Loknob will allow you to make adjustments to your effects, tone, or volume easily by just pulling up and turning while protecting your settings from accidental changes during transportation. Small 1/2" OD ABS PLASTIC LOKNOB for situations where smaller knobs are used like Boss style pedals, mixing boards, etc. Fits most pot sizes. Features new universal mount system. Notes: The M48 48v Phantom Power Supply allows you to use your devices and microphones that require external power in any setup. It can also provide an easy solution when the phantom power being supplied from a venue is inadequate. With the M48 you will always get a clean, full 48v of power for the best sound and low-noise performance. Perfect for home and professional studios, live sound, podcasters, content creators, and more. Perfect for all of your gear that requires Phantom Power like condenser mics. With a single XLR input and XLR output, get connected quickly. No guessing if it's working or how the battery life is doing. Dual LEDs let you know if it's on and if the battery is low. Some "48v Phantom Power" supplies don't quite give you the full voltage you need. The M48 always delivers 48 Volts of clean power. Choose AC adapter power or a battery for maximum flexibility especially when working on location. Made from heavy gauge steel, the M48 is built to last and withstand years of punishment. Notes: The highly durable mixer bag is reinforced with chunky foam, tarped corners, padded shoulder strap and two zippered & padded outer pockets. Notes: The CTRL CASE MASCHINE is specially designed to hold the new NI Maschine Jam or Maschine MK2. Crafted from durable and lightweight Durashock molded EVA foam and a water-rejecting polyester exterior, it is furthermore equipped with a removable (velcro) foam that provides extra protection for all encoders, knobs and buttons. Notes: 10hp blank panel for modular synth system with lightning bolt pattern inspired by the Maths synth module. Notes: The Nektar NP-2 universal foot switch pedal is solid, rugged and ideal for both studio and stage. 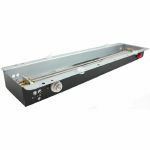 Rubber gripping keeps the pedal in place during performances and polarity switching ensures they work with any keyboard or electronic product, requiring a foot switch. Notes: Add your Reason and Rack Extension licenses to this USB Ignition Key if you are using Reason on several computers, without access to internet. Please note that only one Ignition Key can be authorized at a time. If you are using Reason 7 /Reason Essentials 2 or higher, you can also authorize your licenses to a single computer, for offline use. This way you can use Reason without being connected to the internet, or without a USB port taken up by the key. Notes: Lightweight and durable, Black Series instrument bags are perfect for performers on the go. A rugged exterior and thick internal padding shield your instrument from bumps and bruises, and the convenient shoulder straps make carrying easy. Ideal for everyday use, the CB-BOCT protects your OCTAPAD SPD-30 in style. Notes: Rugged and portable, the RAS-SO1 stand lifts your amp off the floor and angles it up for better sound projection. Durable steel construction supports up to 40 lbs./18 kg, and the compact design takes up minimal floor space. Adjustable rubber feet provide stability on uneven surfaces, and the stand folds down for easy transport and storage. Ideal for home, school, studio, and stage, the RAS-S01 is a great companion for small combo amps and speaker cabinets. Notes: This rack ear kit is for the original Sherman Filterbank, or the more recent Filterbank 2 desktop. Made from metal and includes 4x screws. Notes: Optional Body Strap for Pulse Metronome, allows the unit to be worn over the shoulder or chest. Notes: Finally, a metronome that you'll actually love using! The Soundbrenner Pulse is the metronome of the 21st century - wearable, intelligent, and powered by vibrations. It becomes even more powerful when combined with The Metronome by Soundbrenner, our popular mobile app available for iOS and Android. Using the app, you can create and save complex rhythms, organize them into setlists, and even choose custom vibrations and LED colours. You no longer have to listen to annoying audio clicks. Experience amazingly accurate haptic feedback in the form of strong, distinct vibrations that are easily felt against your skin. Twist the wheel or triple tap to set the tempo to your liking. Yes, it's that simple. Free companion app is the most advanced, intuitive and customisable app on the market. It enables you to create and save any rhythm, change the time signature, choose a subdivision and much more. To help bands and orchestras play with rock-solid precision, we've enabled Multi-Player Synchronisation. Connect up to 5 Soundbrenner Pulse to one smartphone which serves as a master to all devices. In a matter of seconds, you can play together, feeling the rhythm in perfect synchronisation. Each Soundbrenner Pulse comes with two bands. Depending on your instrument and preference you can try out at home which location you prefer and comfortably switch out the bands. Notes: This new version of the solid oak Korg SQ1 stand has been precision machined with a CNC Machine. A recess for the Korg SQ1 has been cut into the sides so once assembled this stand becomes very strong and has great stability for live performance, giving you the peace of mind that your gear is safe. The stand is made from solid European oak and is connected via 4x Allen head Confirmat screws (Allen key & screws provided) into an MDF wood bar. It can also be painted with ease or stained with wood stain to suit your studio. Notes: This stand has been precision machined and hand finished, the panels have been recessed for your Push 2 to make sure it's held firmly in place. The stand is assembled by connecting the side panels with 4 x Confirmat screws. Fixings and Allen key provided, to assemble your stand ready for use.